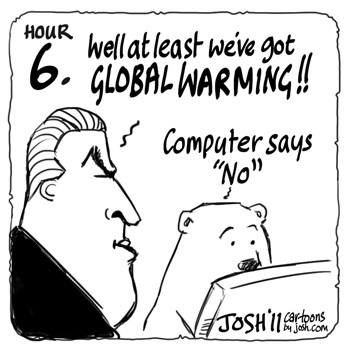 24 Hours of Climate Reality: Gore-a-thon – Hour 6 | Watts Up With That? In the ten year period that Mr. Gore has been arguing about in his CRP presentations as being the period where climate change manifests itself in extreme weather events, it has gotten cooler, even as CO2 continues to increase. That’s an inconvenient truth. 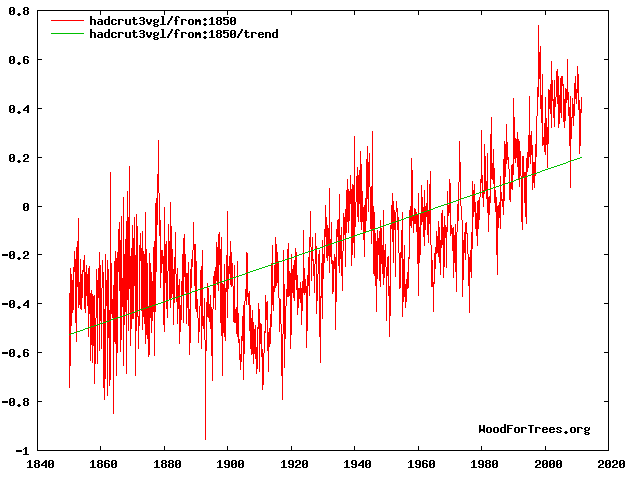 That HadCRUT global temperature shows no warming trend in the past 10 years, which seems to jibe with the lack of sea level rise due to lack of increasing global ocean heat content as we discussed here. I had no respect for the legitimacy of this whole thing, but then they showed a woman struggling to escape a flood and a quote from James Hansen. Global Warming has to be real! Statistically, given the noise of interannual variability, is a decade long enough to discern a trend? I think it’s pushing the limits of detectability; a 2 deg C warming over a century would be an average 0.2 C warming in a decade, and the max/min range in the 2nd graph is 0.5 C.
It’s snowing in the Rocky Mountains tonight, however, its mainly cold rain in the plains. 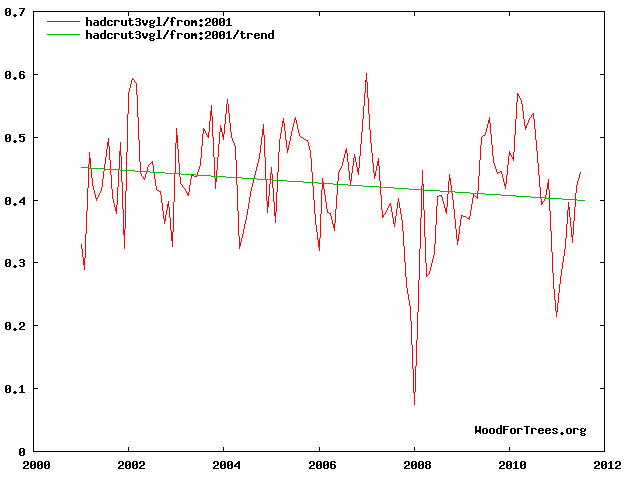 So Mr Gore, if your view is that CO2 is causing the planet to get warmer, how do you explain the graphs above? Could you also please tell me what is the percentage of CO2 in the atmosphere produced by human activity? Finally, what is going to happen to the world’s economy if we adopt measures to significantly reduce man made CO2? If you or anyone else can provide satisfactory answers to the above then I will be happy to support any measures to reduce man made CO 2. Well Oakden, what would you argue the range for a “trend” is? As evidenced by the graph, the temperature appears to rise between 1920-1940. It then drops off, before rising again. Is the 20 years of rising enough to discern a “warming” trend? With all the variables, factors, and strange attractors, ( to borrow a term from Chaos Theory) how can a trend be pinpointed and claimed that it is completley accurate? It might be interesting to conduct a telephone poll asking various newsmen and science reporters around the country to guess how much global warming they think, off the top of their heads, has occurred since 1850. Mr. Gore, if we reduce CO2 in the atmosphere, how many plants and trees will we kill? How much less food will we be able to produce for all those starving children? Don’t plants *need* CO2? I just heard a woman say that the Sun has a negligilbe affect on the Earth’s temperature because “*A* scientific researcher said so”. Yes, I emphasized “A” researcher. Not even a *named* researcher! Some kid who reads the thermometer in the vestibule of his grandparents’ assisted living complex could be called “a scientific researcher” for the love of pete. But I guess we’re supposed to believe this lady because *she* has a faintly British/Aussie/NZ upper crust accent. So, you know, you have to believe anybody who sounds like they’re announcing Masterpiece Theater, right? I can’t comment without giving access to my facebook page. So, I’m unable to comment in their social stream because I won’t agree to the terms. From the look of the social stream, it’s lots of tired simplistic platitudes and irrelevance so I’m not missing out on being part of it. They’re talking about renewable energies, and the lady (sorry I don’t know her name) who is running the debate said she believes that lots of amazing things are happening with renewables and in Silicon Valley and in the US. I felt awkward when she didn’t supply at least one example — It seems purposely vague. Apparently, it’s so scary that Rhode Island has so much coastline and that the tides are rising. They defer to the guy (sorry don’t know his name) for his scientific expertise, because he’s a scientist. I’m been watching for 5 minutes and heard no science. This is what has been happening for 7 hours, I only just tuned in? What I find odd about the flat temperatures the last 10 years is that they occured during a housing boom in the western world (US,Canada,Spain,Portugal, Australia, etc.,ect.) and China’s economy going gang busters creating and exporting goods during this time. Not to mention China’s own housing and infrastructure development. This boom (now bust) burned huge hydro-carbons and output huge amounts of CO2 (anyone have numbers for the previous 10 yrs and the last 10 yrs for CO2 output?). Yet the global temperatures remained flat. The bust and resulting global recessions itself will do more to reduce CO2 from human activity than the laws these fools want to pass now. There is no such thing as an Aussie upercrust. We are all just Aussies here. The mismatch between sea surface temperature and ocean heat content after the turn of the millenium to 2003/4 shows there is likely a splicing issue between XBT and ARGO data. Perhaps you would care to share some of your statistical savvy on this graph … do you think it represents a trend? Or is it also just “noise”? Except if you happen to be part of the political ‘elite’ or one of their sycophants. I’m sure it’s all aerosols. How do global warming “scientists” explain past phenomena like the Ice Age? How do they explain the receding of oceans in ages past? What was the effect of dinosaur farting; ala modern day concerns about gas from cows? It seems the old adage of, “He doesn’t understand everything he knows” is ever present. That is why the trend has gone flat, something the sacrosanct GCMs never predicted, and which threatens their basis and the whole CAGW house of cards. Well, clearly they were not caused by human- induced CO2 because we weren’t producing any. Obviously, now that we are, all other variables are now non-existent, except for the variables not accounted for by a linear CO2 increase! Quite amazing, really. Nice ‘Little Britain ‘ reference there Josh. Bruce, that’s from last January. Relevant, but I imagine most of us had seen it before; I know I had. You obviously haven’t been to Braahton, Vic. Let’s see, the five longest thermometer records show a trend of 0.8°C over ~300 years. That’s about the same effect of a large cloud on a warm summer’s day. Trend or Noise?